Let’s start off with a full disclosure…..we completely understand that the thought of living additive-free can be completely overwhelming and just plain scary. How am I going to remember all this? What are we going to be able to eat? Everything seems to be on the ‘bad’ list so there’ll be nothing left for us to eat. I don’t want to have to learn this information, I just want to be told what brands to buy. My family won’t be supportive. I’ve got fussy kids, how can they live additive-free? It’s too expensive to live additive-free. How will I know what to cook? Believe us…we get it! We thought all these things and more when we first started too, and back then there wasn’t anywhere we could find this information out via a one-stop-shop like what we have set up for you guys with our online course Additive-Free Made Easy (next round coming up in a matter of weeks). So, let’s break it down into bite size chunks so that we can take that fear and overwhelm away from you. The good news is you have the desire to learn and know what nasties are lurking in your food, which means you’ve already taken the first step. YAY! Next, you need to figure out what your pain point is and your ‘why’ for wanting to know this information. Once you know, this will be your driving force to learn as much as you can to feed you and your family the right foods, free from rubbish ingredients. You have health conditions that would be better supported living additive-free. You’ve noticed your kids are behaving differently after consuming certain foods or drinks. You know that your body could feel better by learning this information and eating additive-free. You want to provide yourself and your family with the best possible diet and lifestyle you can. You know there are lots of toxic ingredients in our foods and you want to learn what you should avoid. Honestly, the reasons are endless. When Jo first decided she wanted to learn more about additives and preservatives in food she went on a mission to find out as much as she could via good old Google. To say the process was exhausting was an understatement! But her why was clear, she needed to help her daughter Eva who was struggling with behavioural issues and life in general. If she had to go to the end of the earth to find the answer, then that’s where she would go. Thanks to Jo and Tracey they have taken all that hard work and years of research and created Additive-Free Made Easy. A one-stop-shop of information and resources so you can learn the harshest of ingredients to avoid and what consumption of these nasties can do to our bodies. In our Additive-Free Made Easy course you get all the information you need and guess what? You can print it all out, stick it in a folder and revert back to it whenever you need to. We even give you the transcriptions of the videos so you can print them out too if you want. What are we even going to be able to eat? Plenty! Believe us, we don’t deprive ourselves at all living additive-free. In fact, our bodies are nourished from the good food we now eat. We also still buy packaged food, we just know what to look out for when we check out the ingredient panels. It’s about learning what swaps and better choices you can make which we teach you all about in the course. Whilst we get that it seems that everything is taboo these days, once you learn what food full of chemicals does to your body (and the bodies of your loved ones), then you’ll know why it’s important to live additive-free. We can promise you that there will be plenty of food choices left for you to eat, and you know what? We’re not perfect! For the most part, we subscribe to the 80/20 rule…..80% additive-free and 20% not perfect. But we know what is in the food we are eating so we can make a conscious choice, fully knowing how it will affect our bodies if we do consume it. This makes us empowered! Yep, it would be easier to just be told what brands are good and what brands to steer clear of, but the big problem with that is companies change their ingredients on a regular basis so it would be too incredibly hard for us to be constantly quality controlling a master list of all the good foods in case ingredients change. The much better alternative, that empowers you in the process, is to teach you the information of what additives and preservatives to avoid so that you can be discerning when you shop. We like to subscribe to that old metaphor…. We don’t doubt that. We were overwhelmed too. 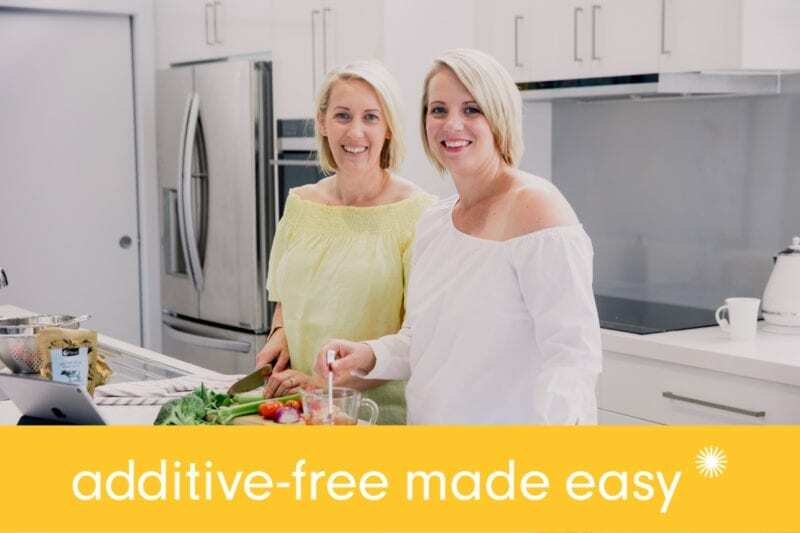 In our Additive-Free Made Easy course, we break each topic down into bite-size chunks so that not only is it NOT time-consuming, but by breaking it down it’s easier information to absorb. Not only that, but you will get access to our private Facebook group with other students who are doing the course at the same time as you so you can all share and support each other along the way. We have found that when you have a tribe of like-minded people for support, the additive-free lifestyle becomes much easier. We also absolutely advocate that it’s about making gradual changes. Whilst Jo pretty much emptied her entire pantry once she learnt what additives and preservatives do to us, we certainly don’t advocate for anyone else to do that. Unless they desperately want to of course 😉. It will be less daunting and overwhelming if you switch things out over time. For example, use up a jar of something in your pantry and when that’s empty then buy a better choice option next time you shop. This is a topic particularly close to our hearts. We still have some unsupportive family members, even after all this time. We will teach you how you can manage this to make life easier for you. And you never know, by leading by example, those naysayer family members just may come around in time. But above all else, you can rest assured in the knowledge that you are giving yourself and your family the best gift of good health. I’ve got fussy kids; how can they live additive-free? Fussy kids are hard, we know. We’re not going to lie and say it will be easy to re-train your kids’ brain and palette to a new way of eating but the rewards will fulfil you in bucket loads because you are setting them up for a lifetime of good health and wellbeing. It is also worth considering, that maybe their fussiness comes from being dependent on the chemicals in the foods they are eating. We get that this is not always the case, but there are some food additives that block certain pathways in our brain so that we either overeat or become addicted to that food. Whilst we do like to eat organic as well as additive-free, wherever possible. Given how much our food is sprayed with pesticides and who knows what else, organic is always the better option. And we get that you pay a premium for organic. However, living additive-free you actually end up feeling fuller for longer because it generally doesn’t have empty calories or addictive chemicals in them that make us want to keep eating. This means that you will end up buying less food than you normally do because your bodies will be satisfied. This is how it balances out. The next big trick is to meal prep. This is key to ensuring you don’t resort to grabbing less than desirable snacks, foods and takeaways. BTW we happen to have a meal planning program called Meals Made Easy which is designed to give you time back so that you are not spending as much time in the kitchen, all while feeding your family with good, nutritious meals that are additive-free. You get 8 weeks’ worth of dinner and snack recipes, shopping lists and preparation guides to help you stay on track. Never forget that knowledge is power and once you learn this information then you become empowered! Where can I learn this information? We are just about to release our next round of Additive-Free Made Easy (YAY). Early bird tickets go on sale Monday 18 February 2019. Head on over to Additive-Free Made Easy for all the details, a further rundown of the program and how you can register your interest so you don’t miss out.